Today starts an interesting adventure. 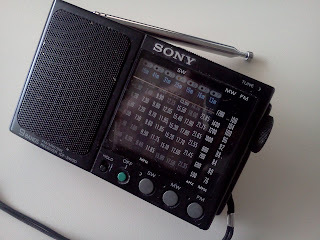 I have been acquiring radios again at a steady rate for the last 10 or so years, plus I still have a few of my old ones. I need to get a handle on this collection, as I have decided that I just have too much "stuff" (will all due respect to George Carlin). Most of it is here, in my garage, in boxes and crates. I'm going to sell quite a bit of it, but wanted to get back into writing at the same time. I will be posting stories about some of what I come across on my blog FOFIO! if anyone is interested in checking it out, and will post links to the articles here. I am calling the series "Radios I Have Known". Enjoy, and if anyone has a good story about a radio, let's hear it!